Essentials for war: supplies, soldiers, strategy, and…libraries? For the United States Army during both World War I and World War II, libraries were not only requested and appreciated by soldiers, but also established as a priority during times of war. In the midst of battle and bloodshed, libraries continued to serve American soldiers and citizens in the several different factions of their lives. “Their purposes reached far beyond housing a collection of books,” explained Cara Setsu Bertram, Visiting Archival Operations and Reference Specialist at the American Library Association Archives. During World War I and World War II, camp libraries popped up everywhere at military bases in the United States and all over Europe, stretching as far east as Siberia. These camp libraries were originally established by the American Library Association (ALA), and at the end of World War I, ALA transferred control of them to the war department, which maintains them to this day. ALA worked with the YMCA, the Knights of Columbus, and the American Red Cross to provide library services to other organizations, such as hospitals and rehabilitation centers. These libraries were nothing glamorous—usually a shed, shack, or a hut built of wood and other available materials. They were run by librarians who volunteered to travel overseas to care for the libraries. Responsibilities included circulating the collections, maintaining them, weeding out books, and acquiring new ones. More than 1,000 librarians volunteered during World War I, and that number only increased with World War II. 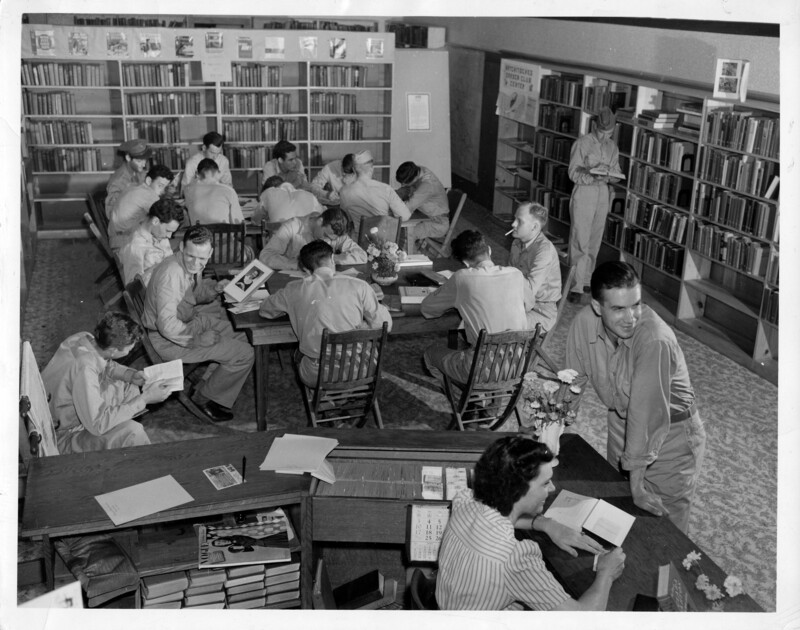 “Servicemen at a Louisiana Library, circa 1942” courtesy of the American Library Association Archives. Used with permission. For many soldiers, Bertram explained, libraries were a place to relax, read, boost their morale, and educate themselves. Many soldiers were thinking about which jobs they wanted when they returned home toward end of the war, so they read about skills for various lines of work. For a few, this was the first exposure these soldiers had to books of any kind, and many illiterate men gained the opportunity to learn to read. The practice of bibliotherapy gained traction during the two World Wars, as many soldiers used reading to treat PTSD, paranoia, insomnia, and other psychological disorders commonly suffered by veterans. Nurses read to injured and blinded soldiers to ease their suffering. 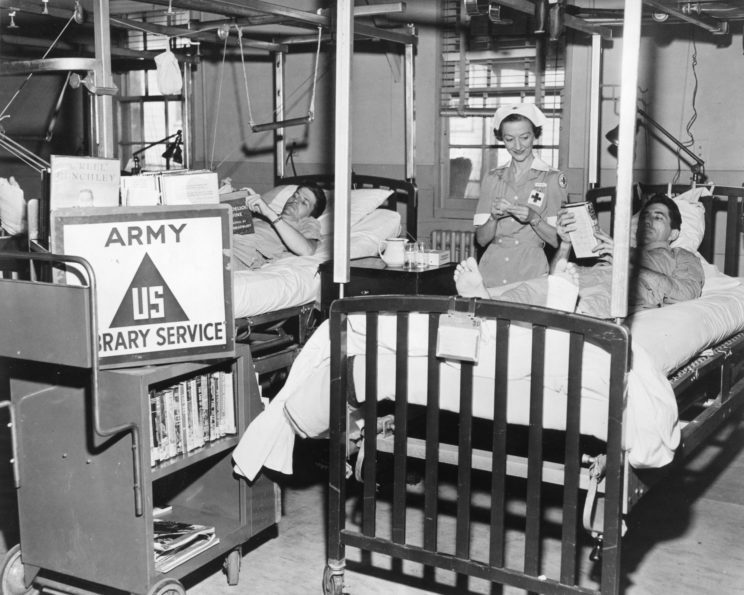 “US Army Hospital Ward Service, circa 1945” courtesy of the American Library Association Archives. Used with permission. Paranoia seeped into these libraries as well, in the form of censorship. Certain books were banned from the libraries in camps, several of them being pro-German sentiment books, pro-socialist books, and books about pacifism. The war department wanted them pulled from libraries or completely destroyed. For citizens in the United States, the military demanded that all books on explosives, invisible ink, and ciphers be removed from libraries, and that any patron who requested such materials have their name put on a list to submit to the FBI for questioning. Even with the careful curation by high-ranking officials, ALA sent over 10 million books to the armed services camps during its Victory Book Campaign from 1942–1943. Reading materials were distributed to various military branches, such as the Army, Navy, American Red Cross, prisoners of war, and even the “war relocation centers,” a euphemism for the Japanese-American internment camps in the United States. At the end of World War I, these camp libraries were taken over by the military, but one library in particular was created independently to serve the American ex-pats who remained in Europe after the war. ALA founded the American Library in Paris in 1920 to serve in part as a memorial for Alan Seeger, a young American poet, who was the son of Charles Seeger, a leader in the group of American ex-pats. The library was meant to be a haven for armed forces personnel serving their allies in World War I. “One of the original missions of the library was to teach and show off the advances Americans had made in the field of library science,” said Charles Trueheart, current Director of the American Library in Paris. Library science was a very progressive subject, and the United States was far ahead of the French in that regard at the time. The library was a symbol of the United States becoming a true world power. Photo of the American Library in Paris in 1926. Photo “10 rue de l’Elysée” from the American Library in Paris. Used with permission. “Americans moved to France in large numbers to build these big institutions that they didn’t build anywhere else in the world,” Trueheart admitted. 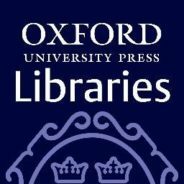 After the First World War came the second, and the purpose of the library morphed. 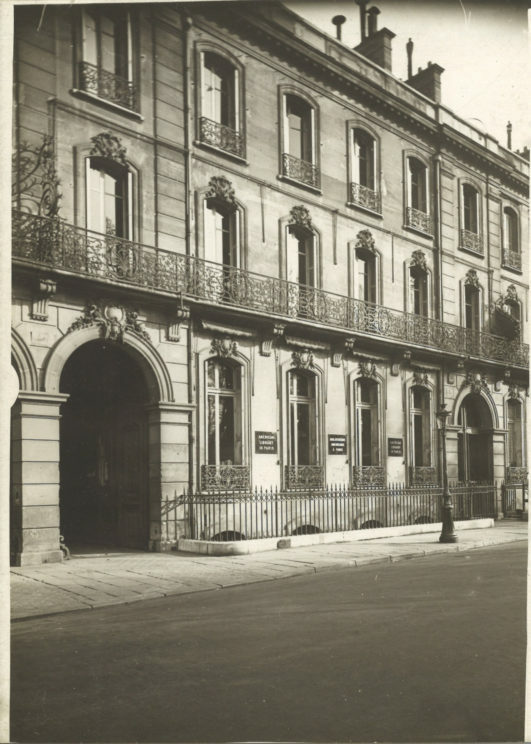 “It was the only library in Paris or France that had books in English and could stay open because of Vichy connection,” said Trueheart. That connection is slightly controversial. Throughout WWII, the library survived in large part due to Countess Clara Longworth de Chambrun. After the first director, Dorothy Reeder, was instructed to return home to the United States for her safety, Countess de Chambrun took over control of the library as the Nazis occupied France in 1940. Due to her son’s marriage to the daughter of the Vichy Prime Minister, Pierre Laval, the library was able to remain open throughout the war. The library continued to operate with occasional confrontations with the Nazis, and even though her family was tied to the enemy, she aided in the resistance. While the library remained open under the guise of being compliant with the Nazi cause, de Chambrun ran an underground book service to Jewish patrons. The value of this library, and the other camp libraries, throughout both World Wars was immeasurable. The American Library of Paris was a lending library, where people came to read and borrow books, and it was the only library in Paris or France that had books in English and could stay open during World War II. “There wasn’t anything like this and it was a treasure,” echoed Trueheart. These libraries were safe havens for soldiers and civilians alike, and their existence during times of war is a true testament to the constant need for libraries. Featured image credit: Photo of military personnel and a librarian in a camp library in France in 1919 from the American Library in Paris. Used with permission. Katie D. Bennett is a Marketing Assistant at Oxford University Press. Many thanks to Cara Setsu Bertram and Charles Trueheart for their help with this post. Books from WWI and WWI still remain, with their bookplates attached, and many can be found at the University of Illinois at Urbana-Champaign library. Today, the American Library in Paris has about 3,000 members, conducts 250 programs a year for children, and over 70 evening literary events for patrons of all ages. Do you have a bibliography about this subject? Only a link it’s ok. It’ s very interesting. Thanks a lot!